Broccoli rabe has a slightly bitter flavor that stands up nicely to the garlic and hot red pepper flakes in this recipe. 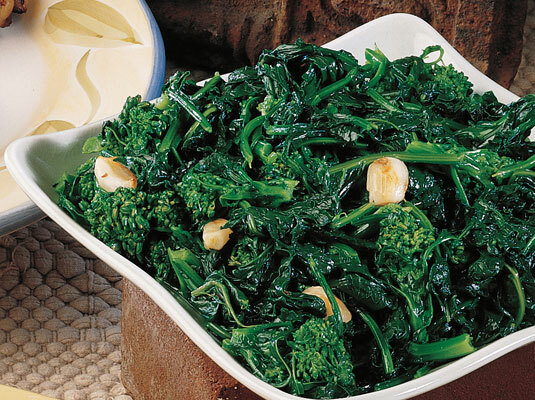 If broccoli rabe isn’t available, you can prepare broccoli, spinach, kale, Swiss chard, turnip greens, and other leafy greens in the same fashion. Wash the broccoli rabe, then remove and discard its tough stems. In a large pot, bring 4 quarts lightly salted water to a boil. Add the broccoli rabe, cover, and cook, stirring occasionally, until the broccoli rabe is tender but still firm, about 5 minutes. Drain into a colander, pressing out the excess water with the back of a spoon. Peel and slice the garlic cloves. Heat the olive oil and garlic in a medium skillet over medium heat. When the garlic begins to brown, add the red pepper flakes and broccoli rabe. Cook 5 minutes, stirring occasionally. Season with salt and pepper, then serve.